This work continues to move along rather handily. we learn that a survivor of Roanoke made a serious effort to leave inscribed headstones throughout the area of the largest native community, better described as an urban conglomeration. It worked and the headstones were collected. What has not happened is that the importance of this city has been ignored. A densely populated valley is observed with substantial stone works and a distribution conducive to intense gardening and haulage by manpower. At contact, this was the largest community in North America and surely numbered thousands.. The famous archaeologist, Robert Wauchope, spent much of 1939 exploring the Nacoochee Valley. 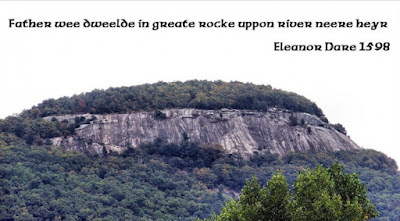 While walking up the trail to what local residents said was Eleanor Dare’s tomb, he spotted a remarkable inscribed stone tablet. It contained both Proto-Creek and European writing. Although authenticated by Wauchope as being quite old, this tablet remains a mystery to this day. Eleanor Dare was one of the survivors of the Roanoke Colony. The Squirrel Mountain Petroglyph contains indigenous glyphs on the left and on the right the letters D and A. These Roman letters seem to be the initials of Eleanor Dare and Ann Archard, survivors of the Roanoke Colony. The double line that separates them seems to be a map. In 1939, the Works Progress Administration (WPA) hired a young South Carolinian, just out of Harvard, to carry out the dream project of a lifetime. He was to supervise a team of WPA laborers on a survey of all counties in North Georgia. However, Robert Wauchope, quickly discovered that the Nacoochee Valley in Northeast Georgia, was the most densely inhabited location in all of North America. Village and mound sites are almost continuous for 18 miles along the Chattahoochee and Soque Rivers. The Nacoochee Valley was created by a line of ancient volcanoes. On the upper right, you can see a collapsed caldera volcano, almost identical to the one next to Track Rock Gap. Wauchope discovered that during the period between 900 AD and 1700 AD, settlement was almost continuous. Some contemporary villages were only 1-200 yards apart. There are at least three terrace complexes on the rims of the Nacoochee Valley. Its principal town was named Itsate, which is the name that the Itza Mayas called themselves. Wauchope’s first step was to go door to door in the valley. He asked to see artifacts collected by pioneer families. He also asked their help in finding Indian village sites and mounds. The Nacoochee Mound with Mt. Yonah in the background. This is the appearance of the proto-Creek town of Nokose, as it looked in the mid-16th century. It is quite likely that Juan Pardo came through here, but equally improbable that Hernando de Soto ever saw this valley. An inaccurate state historic marker near here says otherwise. One of the families, whose farm was immediately east of the famous Nacoochee Mound, produced eight stone tablets that they had found in an Indian tomb about three decades earlier. They said that there was a complex of Indian tombs and the stone ruins of “an Indian city” in the rugged terrain between the famous Nacoochee Mound and Yonah Mountain. The oldtimers assumed that the letters on the stone tablets were “Cherokee.” Of course, they had no clue what the Cherokee syllabary looked like. Hontaoase means “Offspring of those who make plants grow with water” (irrigate) in Muskogee-Creek. There is no way some local yokel could have made up this name. It was not on any maps available at that time, and they certain would not have known Muskogee, if Georgia’s academicians didn ‘t know it. Wauchope urged the family to take these tablets to Brenau College, where the original tablet was being studied. Eventually, a team of Harvard scientists determined that the original Dare stone and these tablets were authentic to the late 1500s. The Williams Family also mentioned that they had found many pieces of Indian pottery on their land next to a massive cone-shaped boulder over 100 feet tall. Wauchope dug test pits and found pottery that we now know dated from about 800 BC (Deptford Style) to 1700 AD (Lamar Style). He labeled it Site 9WH6. The village was much older than the adjacent Nacoochee Mound village to the west. In 2004, an archaeology team from the University of Georgia under Dr. Mark Williams, re-studied the Nacoochee Mound village. For reasons unknown, the team completely forgot the existence of the adjacent 9WH6 village and therefore misinterpreted its newer suburb. Williams assumed that this village and the nearby Kenimer Mound were built enigmatically in isolation, when in fact, they represented further development of one of the oldest and densest population concentrations in North America. The Nacoochee Valley was a cultural fountainhead of the Apalache Kingdom. The Apalache normally did not build large mounds, such as found at Cahokia, IL. Wauchope then followed the trail up to the royal tomb complex and the “Indian city”. He labeled the tomb complex 9WH11 and the massive area of stone walls, cairns and apparent house ruins, 9WH31. While approaching the supposed tomb of Eleanor Dare, he found the tablet above. Intrigued, he almost gave it to Brenau College down the road in Gainesville, but fortunately held on to it. Wauchope had forgotten the section of Charles C. Jones’s 1873 book, which stated that the ruins of Indian towns, built of stone had been encountered in the darly 1800s throughout the northern half of Georgia. The ancient ruins seemed totally unrelated to the pattern of pioneer farms, but Wauchope couldn’t not quite make himself believe that Indians could have built with stone. Corporate moguls and state officials in North Carolina funded a propaganda program to trash the credibility of the Dare Stones. A University of North Carolina professor gave a nationally publicized press conference in which he stated that all the Nacoochee Dare Stones were fakes because “Hontaoase was not a Cherokee word.” Well, duh-h-h-h none of the Indian villages in the Nacoochee Valley, including Nacoochee, ever had Cherokee names. The tragedy was that even though Georgia had some of the most famous archaeologists in the United States at that time . . . men such as Gordon Wiley, Arthur Kelly and James Ford . . . none had ever bothered to learn the Creek language. In fact, no academician in Georgia knew the Creek language. There was no one to challenge the North Carolina professor’s statement. That is still the case today, Southeastern archaeologists refuse to learn the languages of the peoples, who built the towns they study. North Carolina then repackaged a mediocre free lance writer with no credentials on the subject into being an expert of Elizabethan English and history. The Saturday Evening Post published a searing article by him that accused the professors at Brenau and Emory University of being at best charlatans, and probably criminals. Mention of the Nacoochee Dare Stones ceased. Wauchope tucked his tail in and became the first anthropology professor at the University of Georgia. The next year he moved to the University of Kentucky then World War II exploded. Wauchope did not publish “An Archaeological Survey of North Georgia” until 1966. The book is very rare. I bought the last copy available on Amazon at that time. No one knew about the Squirrel Mountain petroglyphs until 1966, and no Southeastern archaeologist paid the tablet any attention. The stone architecture complex around Yonah Mountain has been completely ignored. In fact, there does not seem to be any archaeologist interested in the Nacoochee Valley these days. Some same glyphs can be seen on this tablet, the Track Rock Gap petroglyphs, Forsyth petroglyphs, the artwork found at Etowah Mounds and the Jucaculla petroglyphs in western North Carolina. These glyphs are combination of the original Olmec writing system from around 1000 BC, Itza Maya Postclassic Script and some indigenous symbols . . . or at least that what they seem to be. I will be able to translate the Judculla petroglyphs first because they compose a map of western North Carolina. Anthropologists have not realized this fact yet, because they don’t know the terrain. I see many Itza glyphs on this rock and also know the names of most town thanks to the De Soto Chronicles. Current partial interpretation of the Judaculla Rock. Unless I can find the bison velum on which the Apalache-Creek words were written for the Creek Migration Legend, it is currently unlikely that the Apalache writing system will ever be fully translated. Of course, for almost two centuries everyone said that the English translation of the Creek Migration Legend was lost forever, yet we found it. Well, tomorrow is another day.